I can't believe that it’s the end of summer already. As I write this the kids next door are getting ready to return to school. The leaves on the Japanese Maples are turning all shades of orange, red and brown. And my once seemingly unsurmountable summer projects are complete. This is a summer I will never forget. I remember back to May when I was working 30 hours a week for Levi’s, anticipating two summer camp teaching gigs, and caring for my dying bulldog. At that time, I felt that I could not possibly bear the stress of the months to come. Well, I did. And hopefully with grace. I was even able to attend Surtex, the biggest surface design trade show in NY, with my agents, Parcai Designs, a career goal of mine. Dionne making her Mark at Surtex, Javits Center, NY, NY. A highlight of our NY Trip! These 80's ladies went to the Isaac Mizrahi exhibit, An Unruly History, at the Jewish Museum. It was a whirlwind trip on which my twin sister accompanied me, and I had to unexpectedly take a red eye flight home a day early to assist my husband with our dog’s medical needs. We thought we were going to lose Cookie, but she hung on for two more months. Through the Richmond Art Center, I taught an amazing grant funded project with Rosie’s Girls of Richmond. It was my first time teaching high schoolers and I learned a lot. I had the most fun showing six lovely ladies the basics of branding, marketing and graphic design. We laughed a lot and created the most amazing branded exhibit booth to be used in recruiting events for years to come. I continued to live. And take care of my beloved Bulldog, Cookie Blanca. Until, finally, we needed to hand feed her in bed. We carried her up and down the stairs and outside to potty. We gave her sips of water through a pipette. We propped up her weary head with an airplane neck pillow (which I heartbreakingly found the courage to run through the washing machine yesterday after 5 weeks. Her slobbery stains forever physically gone but permanently on every fiber of my being.) And then on July 18th, Cookie’s last day, we said goodbye to her. That last day before she crossed the rainbow bridge, we tried everything to get her to eat. She tasted organic ice-cream in many flavors (the remainders of which turned into our FEELINGS as Tim and I inhaled pint after pint to console our aching hearts after she was gone). She ate fresh salmon, sliced deli turkey and halibut. And on that very last morning, I had it in my mind that if we could get her a glazed donut, she would for sure eat it. But, she wasn't hungry. I had just wanted her last meal to be something delicious. I will never look at a glazed donut the same. I will probably never eat one again. At 10:30 am, we said goodbye to our greatest joy and truest love, Cookie. Tim had dug her grave the day before. We wrapped her in a cotton blanket, and buried her with her toys, and some cookies for the road. We made a toast to her and cried. I'll never eat a glazed donut again. I had to cancel my first day of teaching art summer camp to kids at our community center because I was too busy throwing my body to the ground with my arm thrown over her pile of rocks sobbing for hours. I laid in a sleeping bag by her grave for an entire day until dusk came. I ate the rest of her dog treats from Petco so I could feel closer to her. I curled up in a ball and slept on her dog bed in the afternoons. I would have eaten my cereal from her dog bowls, but Tim drew the line at that. We experienced the sharpest, bluest, searing pain of our lives, and yet, Life continued. St. Francis, protect the animals. All through August, I taught summer camp art classes to Richmond children ages 6-12. What a hoot, and a learning experience for us all! One of our lessons was on the theme of Summer Olympics. When asking the kids what they knew about Rio de Janeiro, someone shouted out “ZIKA!” Kids, they say the darndest things. But look what we made!!!! I really love teaching. Rio de Janeiro inspired bird marionette! 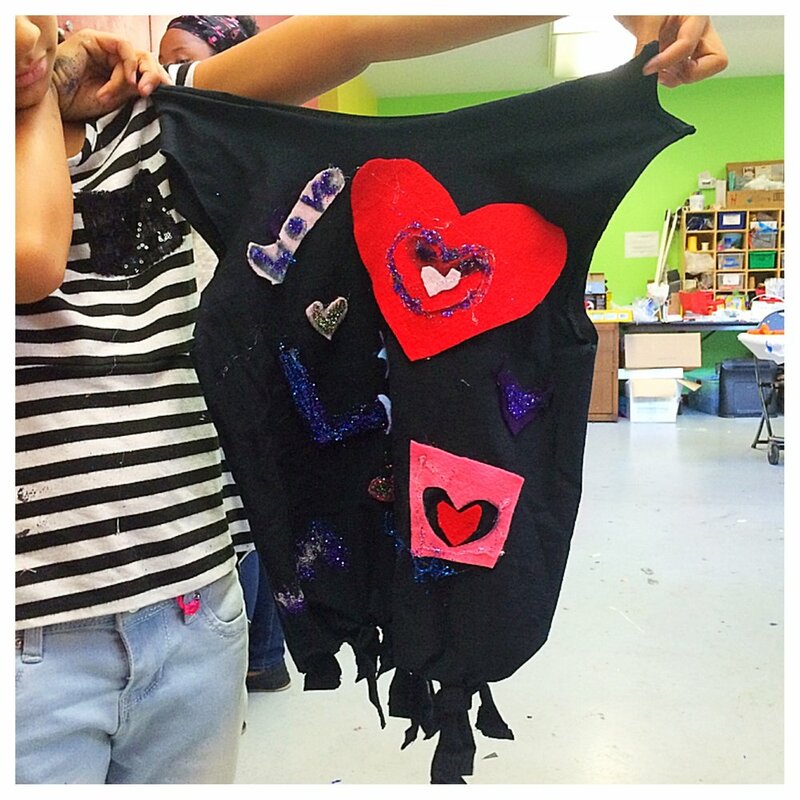 An up-cycled t-shirt bag inspired by Gilson Martins, a popular Brazilian Artisan. I’ve continued to work on my daily practice of art journaling. I can see my style evolving and loosening up. I love the layers, textures and colors produced when combining media with illustration. And in anticipation of an upcoming literacy workshop that I will be teaching, I've learned that I have a new interest in poetry, specifically found word collages. The teacher is always learning. It’s my therapy. We took a weekend trip to Sacramento to meet new friends and see my exhibited piece in my first gallery show at The Brick House Gallery as part of the Creativity Caravan's Tiny Book Show. My Tiny Book, created from my childhood journal entries. It was a fun and bittersweet trip to Cookie’s homeland and her favorite dog friendly hotel. It felt so weird to be there without her. We talked about her every minute of every day, and I started my fourth COOKBOOK which will chronicle her adventures in the afterlife. She’s having a blast, I imagine. We spontaneously took a day trip to the Sonoma County Fair where we rode scary rides all day and ate junk food until we were sick. Oh yeah, and Tim won a contest. And lastly, I took an online summer school surface design class with MIID. I really pushed myself with the briefs, and was very proud of my final submissions. I have the promising beginnings of two very different collections on which I will continue to work throughout the fall. If it’s one thing that I realized this summer, is that my drawing is my healing. I am COMPELLED to do it. It makes me happy and gives me hope. Maybe if you have ever felt lost, and confused, you know that finding a bit of hope is the most amazing thing that can happen at such a time. And friends. I was really lucky to get to spend time with some great friends old and new this summer. Thank you, Universe! It’s just what I needed. New friend Cindy looked me up when she got to California! Old friend Susan, my childhood bestie, came out to SF again this year. It’s foggy outside and starting to smell like autumn. Soon, we will be placing fresh Asters and Mums at Cookie’s memorial instead of the Daisies and Yarrow of Summer. Next month I will be visiting Denver for my cousin’s wedding which will be a much needed healing trip for my heart because I have the best family in the world. Fall workshops are coming down the pipeline, and I’ve still got a lot to work on in developing my portfolio further. I really want to take an extended vacation with my husband, Tim, as the two of us have not had a real vacation in over 9 years. We’re getting to know each other all over again now that we don't have Cookie to punctuate our days. It’s tough and wonderful and scary all at the same time. The cycle starts again. Indeed.